Rangers have announced the appointment of existing board member Derek Llambias as their new chief executive. The Scottish Championship club made the announcement to the Stock Exchange ahead of Monday's annual meeting. Englishman Llambias, 58, a former managing director of Newcastle United, joined Rangers' board as a non-executive director in November. The Scottish FA announced last week that it was investigating Newcastle owner Mike Ashley's role at Ibrox. Rangers and Ashley have been accused of breaking several SFA rules relating to his stake in the club and have been called to a disciplinary hearing on 27 January. Loans from the English businessman, whose Sports Direct company has control of Rangers' shirt sales and retail division, have kept the Glasgow club in business over recent months. And Rangers told the Stock Exchange: "In line with the cost-cutting exercise announced on 12 November 2014, Mr Llambias's remuneration will be significantly lower than previously offered for this position." If anyone was in any doubt about whether or not Mike Ashley was in control of Rangers then this provides the evidence.I think for anyone who has been following this Rangers saga, it won't come as any surprise. Derek Llambias has been pretty much in charge of the troubled Ibrox club since he came in a few months ago.He has been in charge of a huge cost-cutting drive that has led to around 10 people being made redundant. He has also been in charge of a drive to secure new investment for Rangers.Of course, he is Ashley's right-hand man and that has all sorts of implications.Rangers and Ashley have already been called up in front of the Scottish FA to explain their position in terms of his dual role between Rangers and Newcastle. That will be heard in January.But this leaves no-one in any doubt about where Rangers are heading - and who with. Llambias' main priority now, as well as getting that much-needed cash into a club that at the moment has no money, is to face shareholders at a much-anticipated annual meeting on Monday. Shareholders are looking for answers and he will have to be the man now to provide those answers. The club added that David Somers would now revert to his previous role as non-executive chairman. Somers said: "I am delighted that Derek has agreed to step up to the chief executive role. "This is a successful outcome to the process, announced on 27 October 2014, which involved interviewing a number of high-calibre candidates. "Derek has impressed us with his grasp of the issues since joining the group and brings a wealth of experience, particularly from his time at Newcastle United, which we feel confident will be invaluable to Rangers." Somers had taken the role when former Manchester City chief operating officer Graham Wallace was axed as chief executive in October after the club accepted a £2m crisis loan from Ashley. Llambias was initially named as a consultant to the club along with Sports Direct executive Barry Leach, but days later he became a non-executive director amid news that he had been interviewed for the vacancy as chief executive. 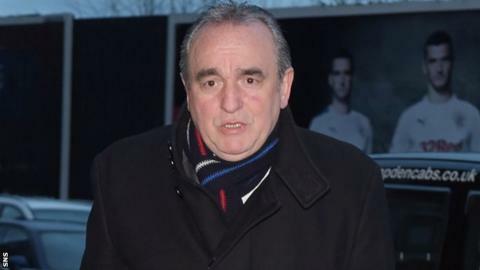 The new chief executive was this week involved in a meeting, alongside football board chairman Sandy Easdale, with Ally McCoist over the manager's future at the club. McCoist handed in his resignation on Thursday but still remains in charge of the team, serving a 12-month notice period, with Rangers believed to be unable to afford a pay off for his immediate departure.